Get Her Wedding Day Look – For Less. If you were in love with Meghan’s dress on her big day as I was, this is going to make your Royal Wedding dreams come true. 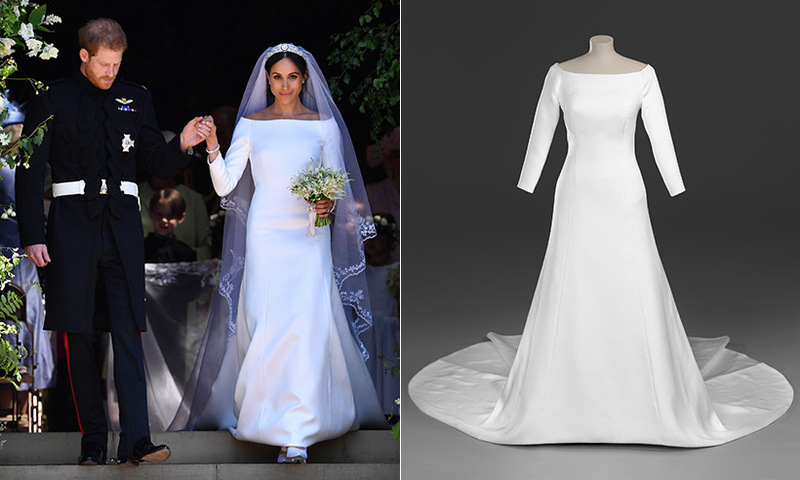 First of all, the dress created by British designer Clare Waight Keller was absolutely beautiful and Meghan carried it so well. But for the vast majority of us all the 100,000 pounds price tag. The cost is well warranted, however, the dress is made from Givenchy’s exclusive double-bonded silk cady and the six expertly placed seams keep true to the design house’s aesthetic. Not too mention the five metre long veil. We’ve compiled here how you can get a similar look to Meghan’s for your own wedding day! Iris is a floor length gown in a heavyweight satin. It’s buttery smooth and oh-so-elegant in white. Pair that with the Iris bodice in an already boatneck neckline and you’re halfway there! From here you can choose to widen the boatneck even more ($90), so it rests just off the shoulders. Or keep it the way it comes. All that needs changing is the back ($60), to mirror the front, and add 3/4 length sleeves ($75). For the skirt, add length to the back with a train mod ($85 for every 36″). Our Elise Tonn version of the Meghan Markle gown will only cost you: $690 +tax. Now I like the sound of that. Send us an email about giving Iris a try!